The distributing of emerald isn’t restricted within one place,while many countries found it ,too.The earliest to be found and explored emerald mine located in Egypt’s Cleopatra field. Actually,the earliest one to be massively explored was in 1537, in Columbia,South America,where had the highest output,taking up 80% of the world’s whole emerald output(about 2 million carats emerald material) and best quality. Besides,emerald ws also found in Zambia, Zimbabwe, Australia, Brazil,etc. However, Columbia still has the best emerald in the world. Though many places,whose output is far more less than other diamonds of the same rank,have emerald,we can even say that only one can be found to be emerald from every one million green Beryl mine.Emerald is fragile and easy to be broken during exploring. 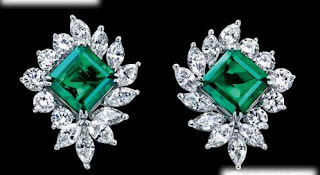 When something is scarce, it is precious.As it’s difficult to explore and scarce in the world, the emerald becomes truly precious diamond in the world and named to be the most valuable diamond of the American imported valued colored diamonds. 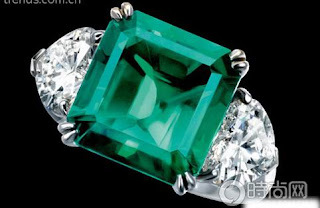 The green color decides the emerald’s value,it's not good with too light or too dark green.Only the mediate green ones with beautiful gloss can become superbes,whose chroma from dark to vivid,hue from mediate to mediate-dark,good transparency and well-distributed color.Even slight color variation will greatly vary the prices. It’s commonly thought that emeralds form the most famous Chivor and Achieva mines will wear a little bit blue,which is considered to be the best emerald. Meanwhile,it will become truly superbes if they are in good clarity,etc.. 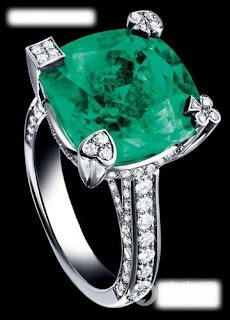 There is an saying,“the more lucid it is,the more precious it will be”.Though many emeralds are lucid enough,the impurity within it is more likely to be found,which is also the basis of “natural”.No natural colored diamonds is 100% pure,impurity and cranny are characters of all natural diamonds. Colored diamonds supreme by their own colors,while we can’t equal purity demand with diamond benchmarking. 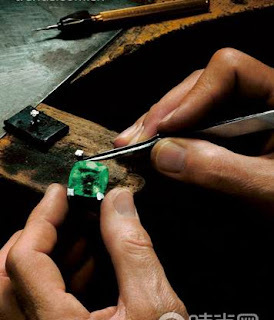 The common way for cutting emerald is “Emerald Cut”.. Emerald Cut used to be applied upon emerald,lessening huge pressure during cutting,so that drilling cuttings can be avoided. Meanwhile,cutting technology is not considered to be an inportant problem in the modern time,when emerald cut method is being applied on multiple styles of diamonds. “Emerald Cut”method can cut for 50 facets of the diamonds.Seen from the top,emerald cutting is just like rectangles bitten off angles.The diamonds with trapmf facets are considered to be the most beautiful diamonds,whose dazzling brilliance on the trapmf angel will be shown beyond the diamonds. This is another“Trapmf Cut”method with trapmf-like layers,which commonly are four corners or stretched facet.It’s so-called “Trapmf Cut”because of the wide and coaxial trapiziform sides it cuts out. Speaking of precious gemstone,you will blurt ou“diamond”. Actually,the price of a good emerald of diamond-size is far more higher than the diamond.Most emeralds are particles,weighing less than one carat.If the emerald is good enough and weighing above one carat,even two carats,it will be quite precious and sells at an incredible price. You should be careful if you want to buy some emeralds when travelling abroad,as there’s a“cultivated emerald gemstone”,which is cultivated under high temperature and high pressure after grinding and purifying the natural Beryl of poor quality. It’s shining and dazzling with tempting tranquility.Sometimes, these artificial gemstones will on sale in some appointed jewelry store.You shoulde not be too surprised to see the charming gemstones and ultralow discount privilege,as natural good emerald will not be so cheap and no discount.Though the cultivated emeralds are also made of natural Beryl ,their prices varies from the genuine ones.